Damn tiny patterns! Oh well I have a shirtwaist waiting to be finished anyway. Make sure you don’t live in Kentucky, though! It’s illegal to carry an ice cream cone in your pocket. Alabamans should be okay, because it’s only illegal to carry ice cream cones in your back pocket there. Damn it! I almost sent you this link, too. Oh, nice details, all around. 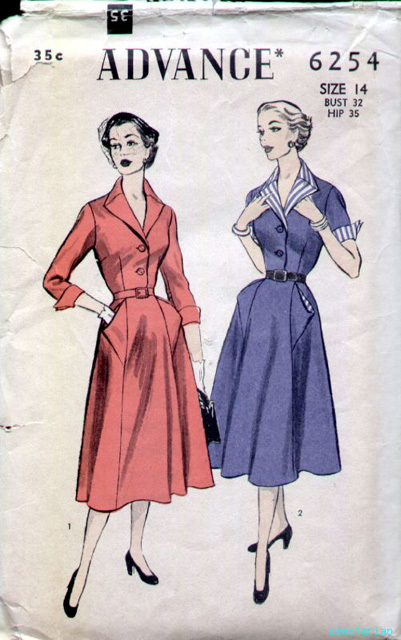 I’d never dare fly with two buttons on the bodice, I wind up with concealed snaps in between.I am wondering about the construction of the pockets. I visualized half of the pocket inside the skirt, then realized that you could make one big kangaroo pocket that connects on either side. You could slip your derringer in there. It would be much more convenient than in your garter and with the ice cream cone thing going on, no one would suspect a thing. Seeing the subtle little hat on the design makes me think- do you do hats as well? but but, the wings are just the RUNWAY (to carry the analogy along) into a DEEPER FULLER INTERIOR pocket. The dress has HIDDEN DEPTHS, or could. That makes it _SO YOU_ Erin. The lady in blue appears to be giving the bird to the lady in red. At least it goes with the whole “wing” theme. I see that what we not know to be a size 2 was a size 14 back then. Wow. Love the wing pockets! And the striped contrast fabric on Mrs Blue.